Learn more about Latin through our publications. In June 2019, Arch N. McIntosh, Jr. will retire after serving as Charlotte Latin School’s Headmaster for 18 years. This Spring 2019 issue of Latin Magazine celebrates Mr. McIntosh’s leadership, his legacies and his family. On these pages, many voices pay tribute to a man who has led the school and its community with strength, vision and compassion. Welcome to this Fall 2018 Special Edition of Latin Magazine. Charlotte Latin is pleased to share the stories behind the projects which will be funded by the Vision2020 capital campaign, the most ambitious fundraising effort in the School’s history. The magazine describes the history and goals of the campaign which will culminate in the 2020-21 academic year. It is indeed an exciting time in the life of Charlotte Latin School. Join us as we take a tour of campus in the Spring 2018 issue of Latin Magazine. You will quickly find that – at Latin – art is everywhere. We peek backstage at technical theater, and enjoy a view from the director’s chair, awe at the endless displays of visual arts, explore the talented twist of our creative writers, and savor the melodies of a robust chorus, orchestra and band program. Please read the Fall 2017 issue of Latin Magazine. We talk a lot about culture on this campus, and when you’re here you can’t miss it. Dive into a Culture of Service, of Philanthropy, of Leadership, Growth and Volunteerism. This issue introduces our Head of Middle School Todd Ballaban and Director of Development Fredrik Akerblom. We highlight the celebrity platinum service in Founders’ Hall with our amazing FLIK team, and share the experiences three impressive Upper School girls had at N.C. Governor’s School this summer. Catch up on Alumni News and Class Notes. This issue spotlights many of the stories that connect us – across the ages – in this culture we call Charlotte Latin. Take a tour with us in the Spring 2017 issue of Latin Magazine, which shines the spotlight on the many teachers who form the Lower School Specials Team, our now-retired Head of Middle School Debbie Lamm, and in the Upper School our Creative Writing Program. Meet Associate Headmaster for Academic Affairs Rod Chamberlain and Sonja Taylor, our Director of Diversity and Inclusion. We also recognize in 2017 our retirees and recent changes to our campus. Our founders believed so strongly in developing leaders that Leadership serves as one of Latin's six core values. This Fall 2016 issue of Charlotte Latin Magazine highlights our leadership development program, "Charlotte Latin Leads with Honor" which brings together existing leadership teaching and development and provides support for leveraging our successes. Read more about how this is happening in this issue. You will also find stories about programs in each school division that continue to develop leaders in areas like public speaking, service, and internship opportunities. The Hawk Eye is the School newspaper, which is written, edited and published by Upper School students. Explore editorials, current campus events and and general interest pieces written by students, for students. The Hawk Eye also includes Hawk Eye TV and The Hawk Talk, an Upper School student broadcast series. 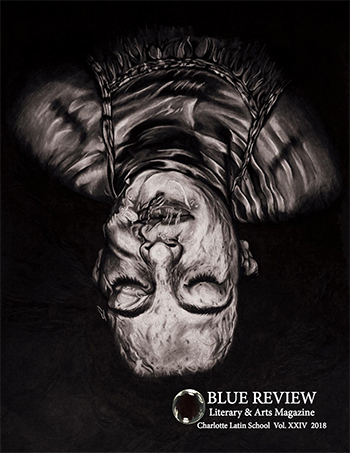 The Blue Review is Charlotte Latin's Upper School literary and arts magazine. The 2017 edition was completely student-created, from selecting the art and writing to designing the layout for each and every page. 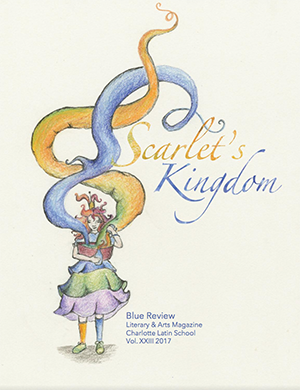 The lead layout editors found their inspiration for this year's volume, entitled “Scarlet's Kingdom,” in Paige Davis's ’17 whimsical colored pencil fairy tale. The lead editors worked with advisers to become familiar with the layout software and studied basic design principles to bring their concept of Scarlet's story – and their own journey – to life. It was a process that took them more than eight months of working countless hours after school, and often on weekends, to complete. Published in 2001, Latin Translations: Stories of our School History takes its audience on a journey through the history of Latin's first thirty years. The School's founders saw Latin not as an alternative but as an opportunity. The pages of this archive bring to life the countless stories, the people and the campus through the voice of an author – Mary Yorke Robison Oates ’83 – who has, in countless ways, made Charlotte Latin her home away from home. The Latin Arts Association is proud to share The New Idea: A Celebration of Visual Art at Charlotte Latin. This 260-page, hardbound, coffee table book is a masterpiece of student and alumni artwork dating back to 1987. The stunning images on these pages capture the soul of a story beyond words on a page. The New Idea is a tribute to the spirit and ambition of Latin students and the teachers whose passion and commitment have built a first-class art program. Purchase your copy of The New Idea.